Yesterday was the afterfeast of the feast of the Epiphany so it was only right that yesterday’s gospel reading (Matthew 4:12 – 17) confirmed the prophecy of Isaiah in relation to Christ that he was indeed the Messiah, the One promised from old who would enlighten and save humankind. The gospel of Matthew has rightly been called the “Torah to the Gentiles”. It contains some 100 references to Scripture and some 40 quotations that are taken directly from the old Testament. There are also nine references to Isaiah. With the aim the purpose of these references is to demonstrate that in Jesus Christ there is fulfilment of Scripture. Notice that the prophecy talks of a people who sat in darkness have seen a great light. Clearly we are talking about a spiritual light. Further notice ” that for those who sat in the region and shadow of death light has dawned.” Here’s the thing: unless we are spiritually awake we cannot hope to see the spiritual light. Yet the prophecy talks of Gentiles who sat in darkness AND who have seen a great light. That must make you stop and think. Isaiah, born about 765 BC, was declaring to the world that in effect the Messiah, when he came, would be rejected by those whom he came for initially and thereby rendering the old covenant nugatory and allowing for the establishment of the new covenant with Gentiles through the promise of his flesh and blood. Is for this reason that the apostle Paul can make his great “men of Athens speech” (Acts 17:22 – 31) and also to refer to Gentiles as being branches grafted in the place of those broken off to share in the riches of the olive tree (Romans 11: 13 – 25). You see that although we Gentiles are now the children of the covenant, we remain warned: the branches that were broken off were broken off because of their unbelief and we are in their place through faith. Yet if we no longer believe then we too will be cast aside. 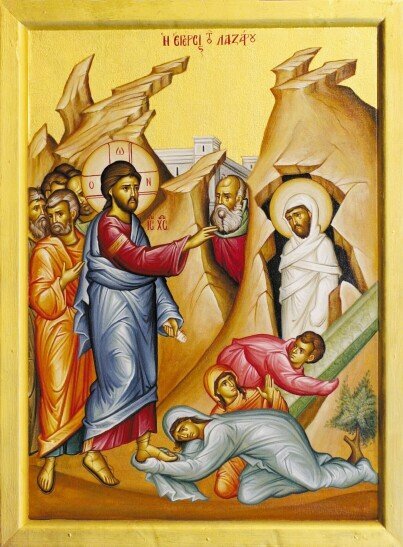 The program for this week is as follows: Thursday St Anthony the great – matins from 7:30 AM; Friday St Athanasius – matins from 7:30 AM; Saturday Mark of Ephesus – matins in Greek 7:45 AM; divine liturgy in English 9 AM to 10:15 AM. Just a reminder: if you wish me to bless your houses/businesses you will need to send me your details by email as soon as possible. Spiritual light is the only enduring reality. Spiritual darkness is the absence of that light and if the light is absent then, no matter how full your life may be with things of this world, how deep is that darkness.